A late visit to the “tabo” or market day at the large central Dao market in Tagbilaran at noon meant I had missed most of the produce sold earlier in the day. Fridays are the THE market day but our “fast” ferry from Cebu City just wasn’t fast enough. There were still a few vendors, and these incredibly vibrant leaves caught my eye, and a local said they were “bago” leaves, and used in soups and stews. 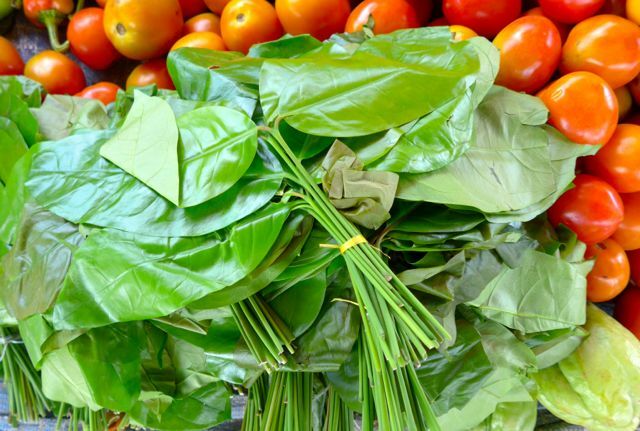 I had come across bago leaves once before, in a small mountain market in Cebu, here, and at the time I figured out their scientific name was gnetum gnemon. That’s one very lively green leafy vegetable indeed. They look like young cacao leaves. Is it bago as in new or as in sago? You’ve been gnashing gnetum gnenom crackers and you dint gnow? This is one of the instances when I would hit the “like” button on that comment, if I was on FB. Love the pun (w?). thanks MM for visiting my native Bohol. Footloose, it’s called bago. we used to add it in ginataan or just a simple broth, but has never added it in fish tinola or tinowa in Bol-anon. it’s uses in cooking is similar to malunggay, but has a different taste. We have lots of bago plants in our yard planted by our late father. Our family like it so much. Good for linagang karne, sinabawang isda, tinulang mongo and ginataang veggies. Vegetarians, try it and you’ll really like it! Your sense of wonder is pleasantly	surprising. Almost all herbs, plants, and the like have food and pharmaceutical applications in one form or another. There are several databanks around – the CLSU in Nueva Ecija, UPLB in Laguna. In Manila, RTU has a mushroom lab that may interest you, while PUP has a food technology library in its sta mesa campus. I remember these from 10yrs back -you will have to check how current they are. Cheers ! Plenty in Negros Ooccidental.. In -law in Kabankalan sent me a bagful . Good sautéed with ground beef soup..	usually found during Market Days in towns. Texture is similar to Collards, without the strong odor of the wide-leafed vegetable. Thanks for this interesting info. I also used to work in Bali, Indonesia and enjoyed emping belinjo crackers. I like the one spiked with chili or pedas. I hope the folks in Bohol can learn how to make the seeds into crackers so others can enjoy the novel experience. Selamat makan! I like emping, too, MM! i’ve never tried bago leaves. wonder if the tree grows in mindanao. footloose, hahaha…..you’re back, and in fine form, as usual! This post made me truly miss having sop buntot at the Borobudur InterCon in Jakarta! I adore Indonesian food- just this week I made Gado-gado (for Meatless Monday) and paired it with emping. Having a well-stocked Indonesian “sari-sari” store in our district is a welcome presence. Sa amin sa Romblon, ang tawag dito ay “lumbay” at madalas ito isama sa ginataang langka o kaya’y sinabawang isda. Marami nito sa bahay ng tiyahin ko sa Alcantara. Madalas pinamimigay lang kasi marami naman. Good find! I was looking for the name of these leaves. Our househelp used to bring these back with here when she comes back from Romblon. We use this in a savory ginataan with pork and shrimp. They call it “lumbay”. Always wanted to grow this plant here. MM, you were so spoiled! I would have sop buntut every week, too, if I lived at the Borobudur InterCon! I remember that there would usually be celebrity diners in the cafe- a general, a movie star, a politician, a tycoon… all excitedly pointed out by the staff. (I once went to a Jakarta mall and spied a sign in a food court stall stating “Sop Buntut by the former chef of Borobudur InterCon.” Of course, it was a letdown.) And what a privilege to know when best to have their famous dish! where can i find bago in manila? I relly love ginataang bago. Parang laing lang pag kaka luto pero mas masarap pa sa laing. ?